Since I broke our exciting new bathroom news I’ve been collecting photos to share. Really, it’s more than two posts’ worth, but I don’t want to drive you all nuts. Still, the whole project has sort of been taking over my life, plus I’m excited because we’re starting tomorrow!! Whoop, whoop!! So I’m going to inflict a bunch of photos on you in one long, long post instead. Because I could talk about this all day, baby! 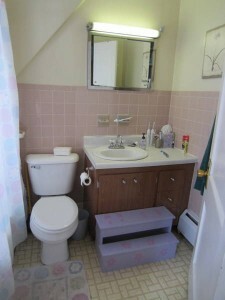 First, I thought that I’d show you the awful full bathroom that we all share right now. Oh, sure, you’re saying. It’s not so bad! It’s kind of. . . cute. Well, you’re kind. Too kind. Really, we should have gotten rid of this bathroom long ago, in particular because it’s terrible for kids. The vanity’s tall and the mirror’s high, which makes it difficult for them to see in the mirror. In fact, when I want to look in the mirror closely, I usually stand on the stool with one foot and put my other foot up on the counter so that I can lean in. There’s no dignity there. And the light! It’s this humming fluorescent thing, and you can only turn it on with the switch which is way the heck up there, on the end of the bar of light. Which means that the kids can only turn it on by climbing up on the vanity, too. There’s an overhead light, but it’s comically dim. And there’s no air vent. 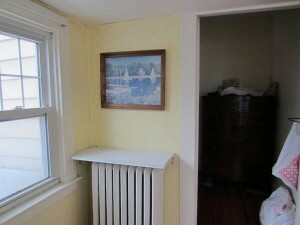 When we bought the house, the only literal and figurative bright spot about the room was the window. 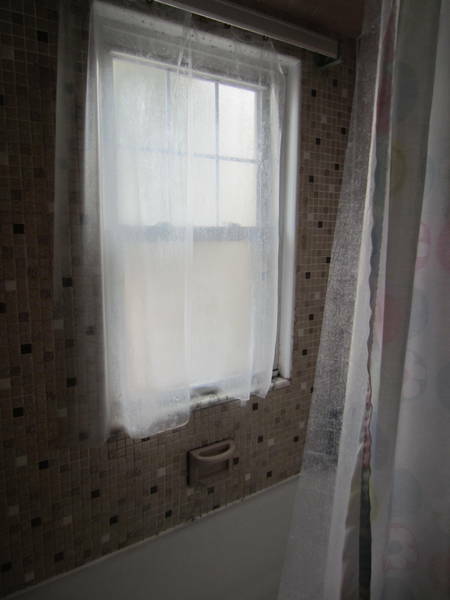 Except then the building inspector said we’d have to hang the shower curtain, which basically doubles your chances of having a curtain sticking to you mid-shower. And I hate the tile. And the grout is ewww. There’s some old-fashioned trap-in-the-pipes thing that means the bath drains slowly, encouraging soap scum. Actually, it drains slowly, and then very slowly, and then so unbelievably slow that Cute W has to remove this screw-on section of the wall to get access to the pipes with a trap that’s hopelessly clogged. Then he plunges like crazy while I create suction in the pipe with my palm so that he can remove all the yuck. Then the cycle begins again. 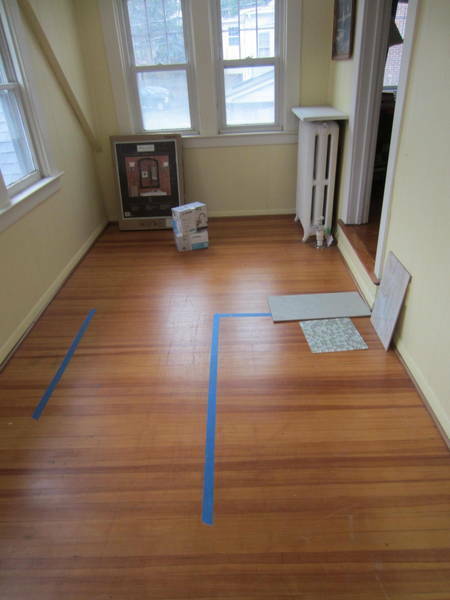 Apparently it’s a common thing in old houses–the contractor knew all about it. We never would have survived this long if Cute W weren’t handy. And, ugh, the whole room is so damn old. 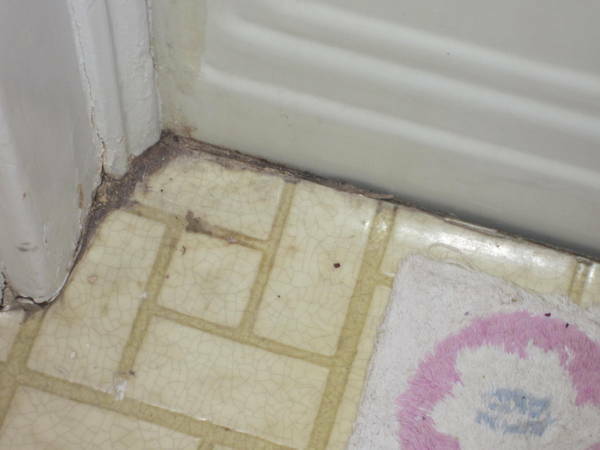 We have nasty, nasty linoleum that was dirty beyond possible redemption years before we ever assumed ownership. Even if I use a cleaner that is unbelievably hazardous, there’s no way to get rid of this stuff. Actually, the shower curtain and shower mat are about ten years old, but it hasn’t seemed worth it to buy fresh stuff and put them into this yucko room. So, yes. The girls are deeply jealous about the bathroom, but once we have a back-up shower, it’s going to be tough to resist improving on this. Okay, enough whining about what the present bathroom. There’s been some serious shopping going on. Of course, we’ve got the constraint of a small space. In the plans, our architect drew in a “Euro-style” vanity, which seems to mean that the sink overhangs the teensy weensy vanity. 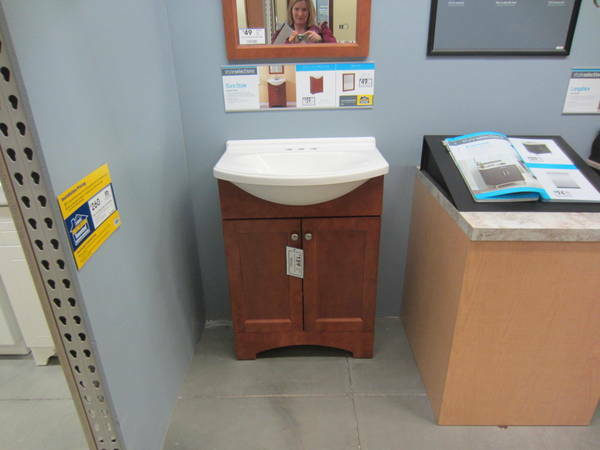 Apparently the standard vanity size is 21″ deep, and that’s too deep for the space we’ve got. So I went looking for vanities. Look–I accidentally took a picture of myself taking a picture of a vanity! 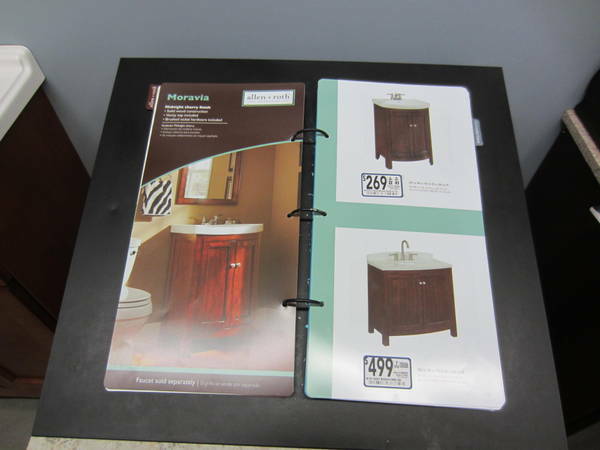 I was walking from one overhanging sink vanity to another overhanging sink vanity when I saw another petite vanity that I liked oh-so-much-more than them (it’s below on the left and the upper right). I liked that the cabinet was bigger, so the sink wasn’t just hanging out there. But the euro-style vanities were 14″ or 16″ while this one was 18″. It seemed like the extra 2 to 4 inches was too extravagant. Then I realized that those numbers just mean the cabinet, not the sink itself. When you measure by the sink, they all stuck out about the same amount. Yee-haw! So that was the high-drama choice. The vanity’s got a matching mirror and cabinet, so that was easy-peasy (you can see the mirror above, too). We’ve chosen tile and we’ve got a faucet and shower hardware and a toilet. 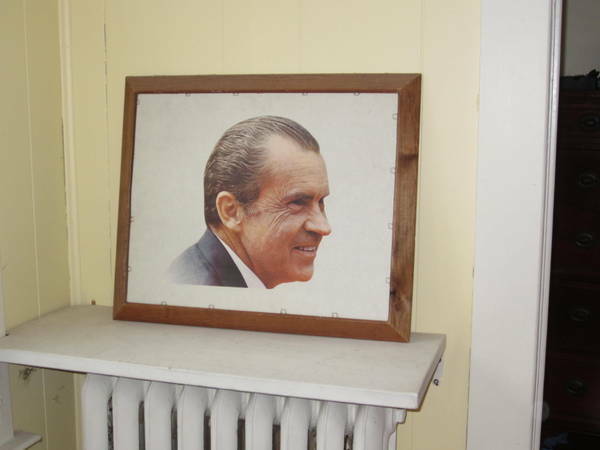 I collected my booty for a still life–except for the toilet, currently camped out in the screened porch, too heavy to move. And it’s been a project, but I’ve managed to empty out the room! 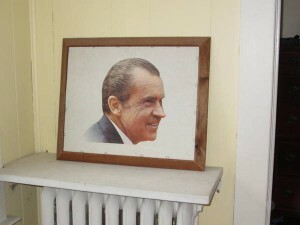 As I took a picture, I noticed that I’d forgotten one last thing: a picture. I love this picture, and not just because I’m a sucker for Impressionism. Oh, no. This nifty little print is a treasure that we found when we were sorting through some of Cute W’s Grandma’s things, trying to decide what to salvage and what to donate. We liked it right away, and then we turned around. . . .
How fun is that? Apparently they used the back of it for some campaign party.